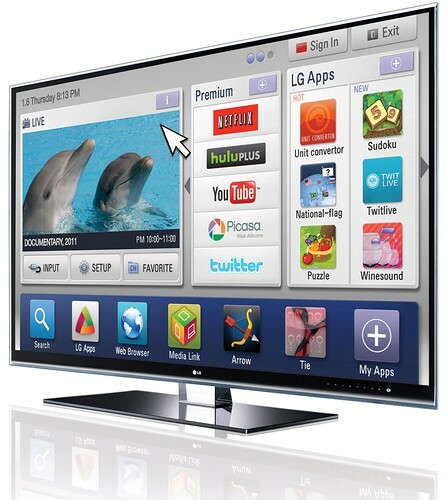 106 million Internet-ready TVs will be sold (and connected) in 2012. That statistic, from Piper Jaffray’s Gene Munster, quoted in Barron’s earlier this month, still blows my mind. The article was bullish on Apple’s financial prospects should it enter the proper TV business and sell an estimated 1.4mm units. But Apple’s shadow hides the bigger story in that article. Consumer electronics companies, such as our partner LG, are creating the largest global distribution network into the living room. Smart TV, as LG calls their platform, is to the TVs of yore like smartphones are to feature phones. As a result, consumers will have a wider variety of programming available to their TVs. Video programmers of all sizes will have an addressable audience of millions of more viewers. Together, the Connected TV footprint (including Internet-connected Blu-ray players and televisions) will be larger than any over-the-top (OTT) platform (measured alone or in aggregate with all OTT systems) and a few times larger than the footprint of the largest cable or satellite operators in the world. Let’s spell it out a bit. OTT – Boxee and Roku, the two best open OTT platforms imho, will probably each have over a million units in the market. Boxee software will run on a few different hardware platforms by then. They seem to have some great traction. Google TV wasn’t successful in its first incarnation. But let’s give them a mulligan and assume the next version will be better (or just buy Boxee, guys). And let’s assume Apple TV gets opened up for third-party apps. So overall maybe we get to 5-10mm total OTT boxes shipped by end of 2012. That’s being generous. Cable and Satellite – These systems are geographically restricted and peak at a maximum of about 20-25mm in the US, for the 2 largest operators. OTT Video Service Providers - Netflix has passed 20mm subscribers in the US (nipping at the heels of Comcast) and Amazon.com is getting aggressive with the recent acquisition of the UK's Lovefilm, and the announcement of free video delivery for members of its Prime program (thanks, btw). These services don't compete with the consumer electronics companies. Instead, our research shows that "tent pole" catch-up TV services such as the BBC iPlayer and new video subscription offerings like Netflix and Amazon.com actually drive people to take advantage of the interactive features of Connected TVs. Gaming – This audience is significant. 12.5 million or so Xbox Live Gold subscribers using that platform for things other than gaming. Let’s be generous (and lazy) and triple that number for PS3 and Wii. A total addressable audience of about 37 million connected gaming devices. Round up and say 50 million to account for another year or so of sales and adoption. Strictly a back of the envelope calculation on my part. It’s sizeable but much smaller than the Connected TV opportunity. For content programmers, this means a world that will continue to be fragmented by platform, as well as runtime, codecs and DRM technologies. There will be work involved with every new opportunity. I advise our clients to focus on the largest platforms that are most compatible with their existing technology investment, in particular existing methods for monetizing and measuring their content. This puts Connected TV at the top of the list. Looking at this from the consumer perspective, Connected TV stands out for reasons other than just the scale of the audience. First, it is notoriously difficult to get people to install new hardware in their living rooms. TVs are often mounted on the walls – the inputs and cabling sometimes difficult to get to. Second, the value proposition for a specialized new box in the home entertainment system has to be extreme to get a buyer to make a change. Tivo, maybe the best word of mouth consumer electronics product in history, capped out at about 3mm subscribers. Living room inertia is tough to beat. It’s that potential that should be very exciting for content programmers.